Cnidaria are some of the simplest and most beautiful "animals." These creatures are flower-like and resemble plants in many respects. However, they have a mouth and a simple digestive system at the center of their tentacles. Because of these two features, these creatures are considered animals and not plants. 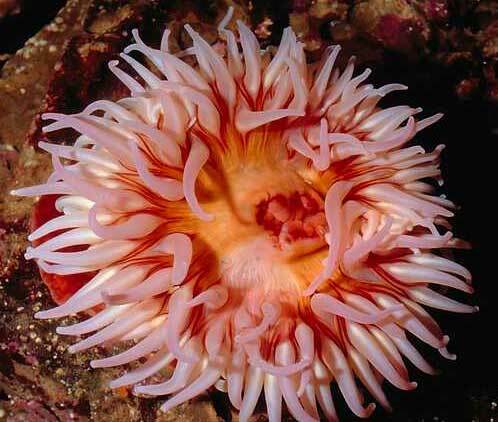 There are 9000 species of Cnidaria. Cnidarians are simple, radially symmetrical, animals. Radial symmetry means that the body is a hub, like a bicycle wheel, and tentacles are spokes coming out of it. The Cnidarians include the hydroids, jellyfish, anemones, and corals. All Cnidarians use tentacles which have stinging cells which are used to subdue and capture food. The word "Cnidarian" means "stinging creature" in Latin (an old language that is still used in identifying animals). A stinger can be set off when a tentacle touches something. The stinger contains a toxin which disables prey. Most Cnidarians stingers are not powerful enough to do any harm to people. However, some jellyfish can deliver very painful, and sometimes fatal, stings to people. Cnidarians can have one of two basic shapes: polypoid or medusoid. The polypoid is the shape of corals and anemones. It is characterized by the mouth and tentacles facing up, and the other side being anchored to a colony of the same creatures (like a coral reef). Medusoids are usually free swimmers, like jellyfish. Their tentacles and mouths are generally pointed down, the opposite of polypoids. 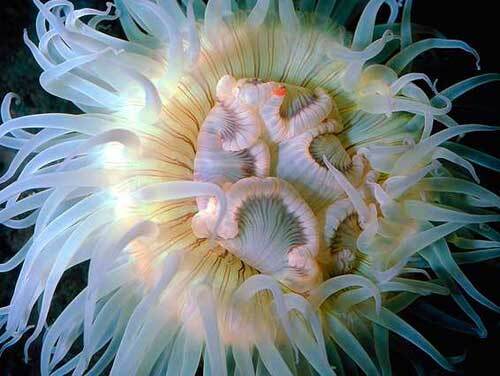 The water animals (hydroids) and bowl animals (anemones, corals) usually live at the bottom of the ocean. These creatures usually have a polypoid shape, which means their mouths and tentacles face up while their other side is attached to something. Some live alone, but others live in colonies (like coral reefs). A coral reef is really a colony of hundreds or thousands of polyps (which look like tiny anemones). 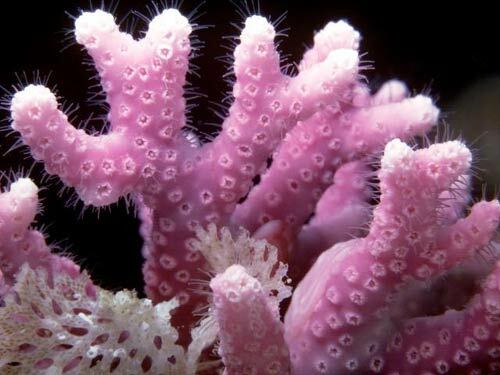 The polyps live together, anchored to each other, sharing living tissue and food resources. Jellyfish belong to a group of animals called scyphozoans. Jellyfish are not really fish (they lack a spine and many other adaptations found in real fish). Jelly"fish" are medusoid in shape and are free-floatingthey are not attached to anything. They swim around the ocean with their mouth and tentacles pointing down. Some jelly "fish" are very poisonous to humans, occasionally even fatal. However, most jelly "fish" are not dangerous to people, their poison will only cause a mild rash similar to poison ivy.